Completed Frankie Baseball top + awkward expression! This pattern is from Tilly’s book ‘Stretch’ and was the one that really made me excited about my preordered book arriving. 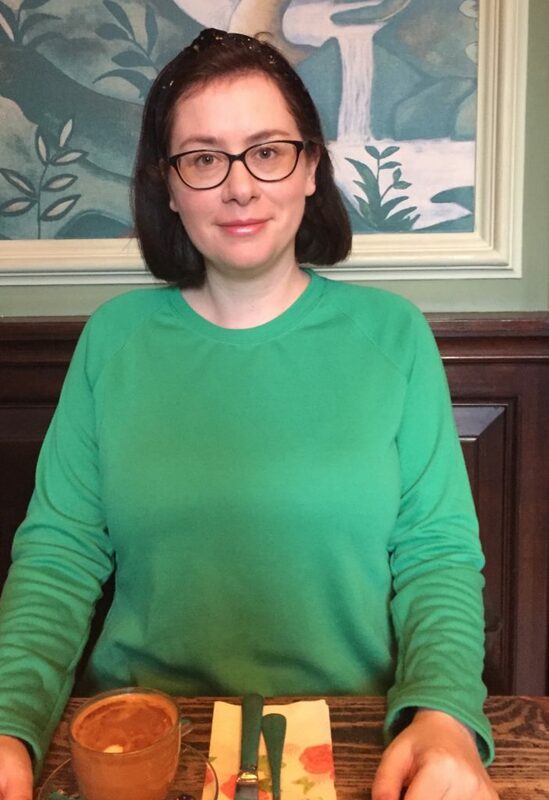 I’m a bit in love with raglan tops recently: I like how colour blocking the arms make them look sporty and they have a nostalgic, 70’s vibe that appeals to me. I have a large bust, and the sort of fit this top has could easily make a tent below my bust – something that is really annoying to wear as cold air gets in under the loose fabric! Sewing the neck in place: easing in the neckline along four seams (instead of the two that I am used to doing) made me worry I would stretch or pucker the neckline. I cut out the size 5, and made no changes to the pattern at all. It sewed up very quickly, just with a few smallish niggles. First of all, when I attached the sleeves, I realised how much wear the raglan seams would need to take. One row of zig zag stitches to hold them on seemed to be a little light, well that’s what I convinced myself, so I decided to top stitch them using a twin needle. 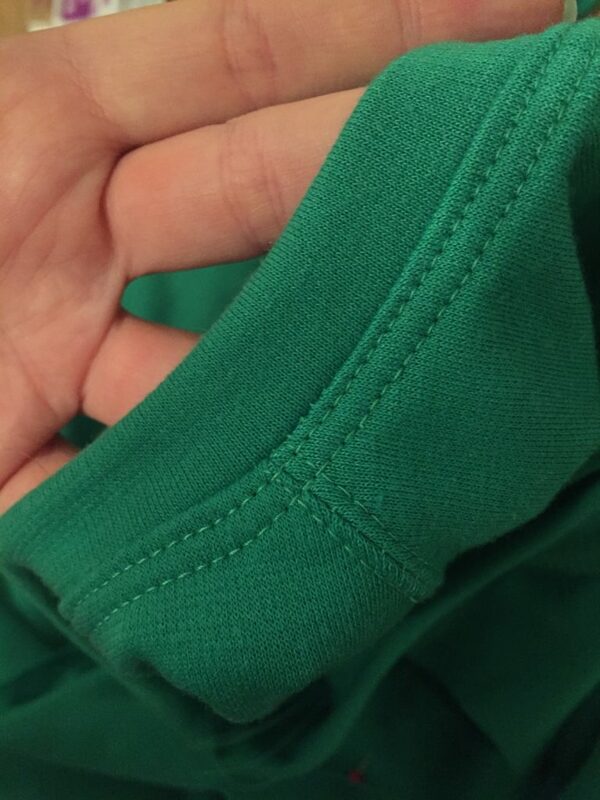 This also captured the seam allowance in place either side of the seam, rather than in one direction – which could cause bulk. I really love this finish and will definitely do it on the next Frankies I have planned. I love sewing with twin needles so its any excuse really! The neckline was a wee bit tricky: the neckband seemed very small and I wondered how on earth it would fit, to the point where I almost recut it longer. Glad I didn’t and I trusted the pattern as its fine. My neckline does appear to be higher than the one on the model in the book. I don’t know why – perhaps its the fabric? There is a bit of light puckering around the front of the neckband which I think I could get rid of with a bit more pressing. The instructions were straightforward and easy to follow, and there are only four pattern pieces so its quick to trace and cut out too. The curves in the pattern are designed for women’s bodies, plus it sews up true to the size it says it will (if only all patterns were like this!). 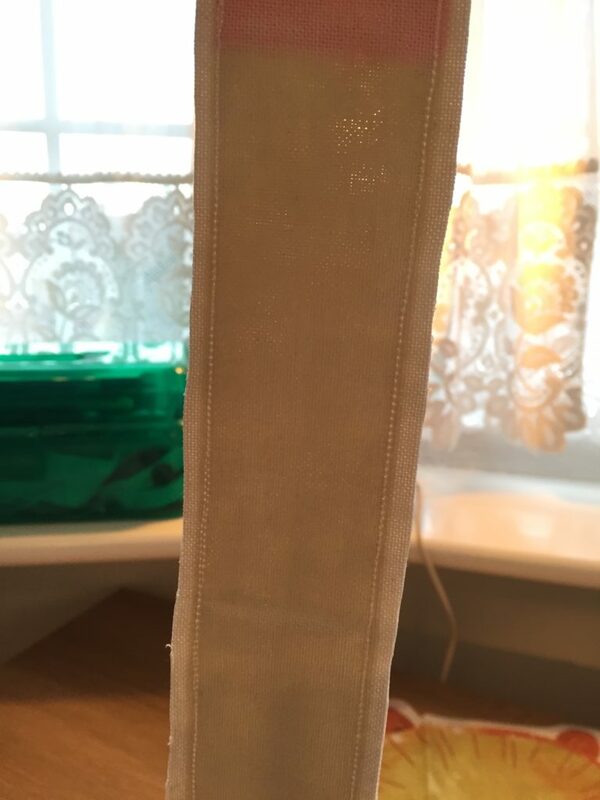 Sewing toiles is really boring and something I never want to do – but – I think doing this one has made me a bit more likely to bother in future – it took a load of pressure off knowing it was cheap fabric, and that it was just a test run. The garment itself is wearable, and it has made me sure I do want to use precious fabric on another version. Next time I am going to lengthen the bodice by about an inch as the hips sit closer to my waist and are a bit flappy, and I’ll try the 3/4 sleeves. All in all, another great and wearable pattern from Tilly! 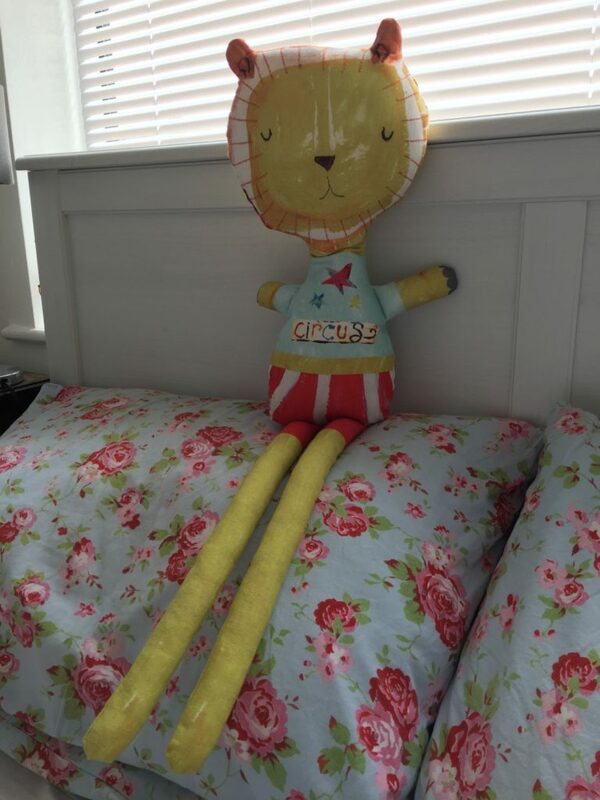 Pre printed lion toy to cut out and sew: doesn’t it have a kind face? 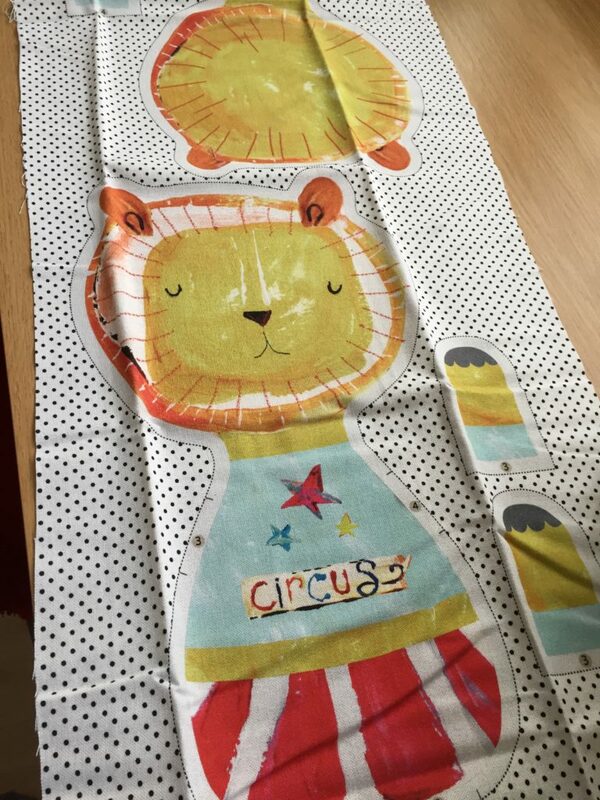 The kit consists of a length of fabric, with a printed lion design on it, with cutting lines around the outside. The fabric is quite heavy and has a visible texture to it. 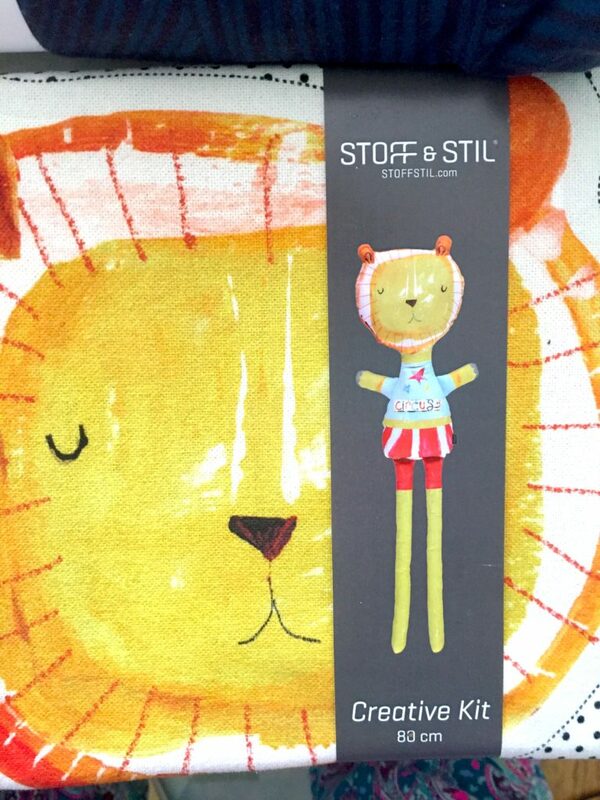 The design of the lion is loose and sketchy which is what appealed to me: its not too fancy and perfect so it already looks well loved. After unfolding the pattern I was surprised to find there were absolutely no instructions included! I had expected to find something on the card insert that the fabric was wrapped around, but no, there was nothing. The pattern is clearly very simple, however I was hoping for some instructions about the best place to leave open to turn the toy from the wrong side to the right side. Last week I managed to sew and complete two garments: another Tilly and The Buttons Agnes top, and a gathered chambray skirt made using her Clemence pattern from Love at First Stitch as a starting point. Making a second Agnes top was very quick and easy. 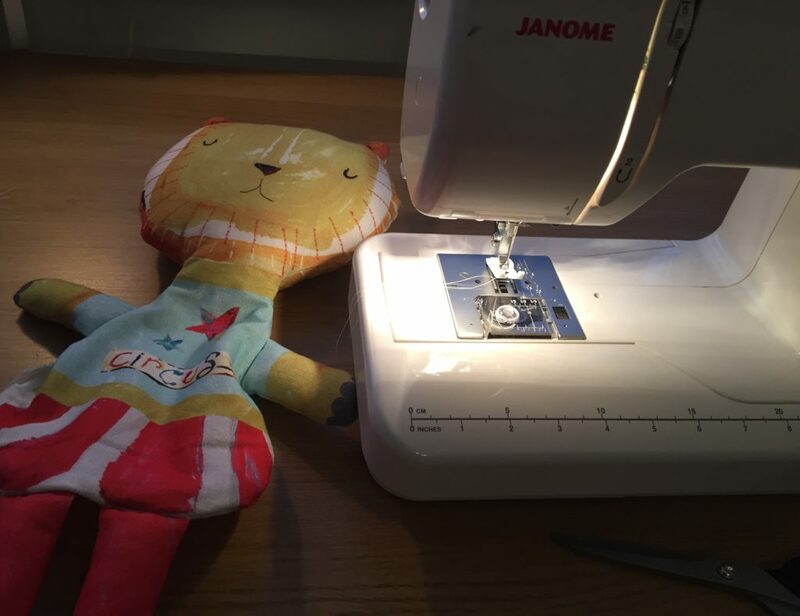 Being able to sew it up with only a few checks of the instructions made the process so much faster and enjoyable. Have a look at my first Agnes top here. I used up some thin red jersey from my old sewing stash to make this. I think it will have been a remnant I picked up from Heathocoat’s, maybe four years ago?(!). Nice to finally get it used up. Because its quite thin, sewing the neckband in was a little tricky but fine in the end. 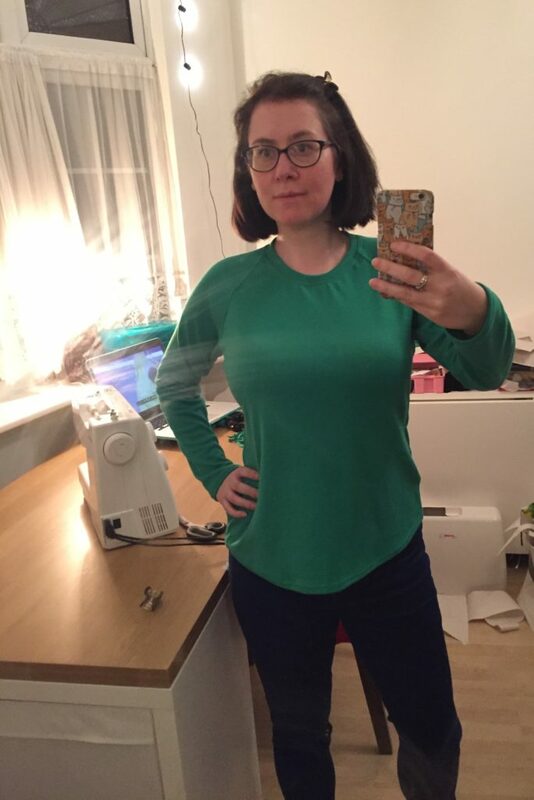 I love the fit and the look of this top – I don’t have any other red tops like this and I have already been wearing this straight from the sewing machine. Is there anything more satisfying than making something and getting to use it straight away? 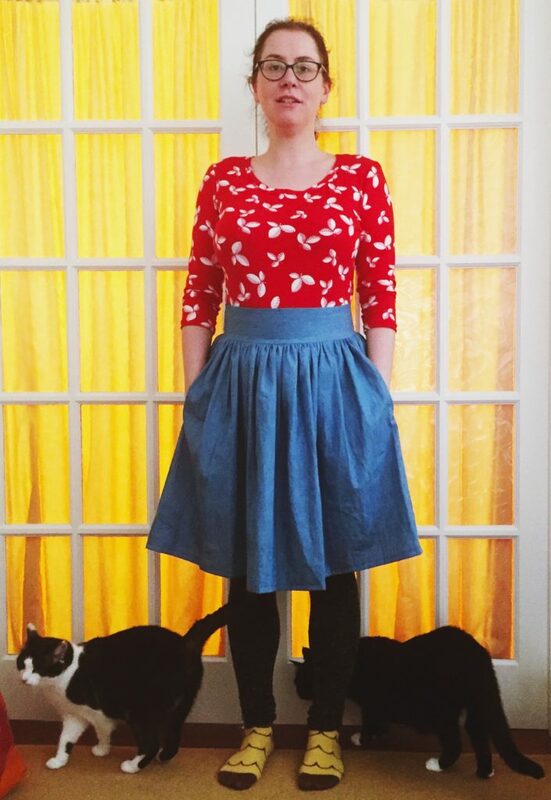 I used the Clemence ‘recipe’ from Love at First Stitch to start making this gathered skirt, however, I found the instructions confusing, so I finished it off using what I have learned from making other gathered skirts in the past. I used the lovely soft chambray I picked up in Malbers Fabrics and I love how it looks – its exactly what I wanted. I added pockets using the template in Love at First Stitch, and they are the perfect size. These were my first ever in-seam pockets. I also did my first ever invisible zipper (it could be a bit more invisible than what it is) and my first ever buttonholes! Yes, the zip could be hidden better, but I am happy to have got it to work! 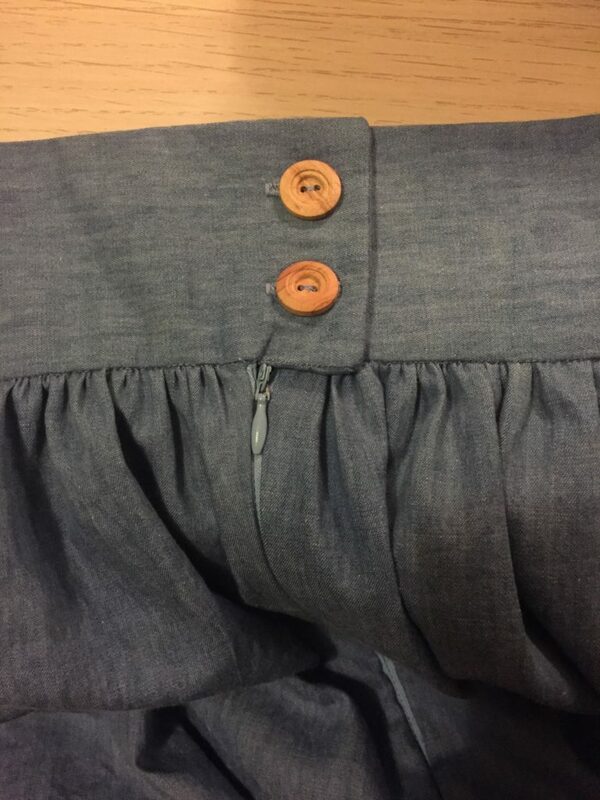 I’ve been scared of trying to sew button holes for as long as I can remember – it just looked like it was going to be so difficult to make them work, and my fear has been that I would mess up my final garment and ruin hours of work. I decided to knuckle down and try them with this skirt as I had my heart set on having some wooden buttons on it. It turned out to be totally OK! I need to learn from this, and just give things a go. Some of my practice buttonholes – can you see where I realised I needed to change the width and it magically worked? It took me a few YouTube videos to finally work out how my buttonhole foot worked and a bit of twiddling with the stitch width, then suddenly it magically worked and I was sewing buttonholes! The chambray frays a lot. I’d have liked to have French seamed it, however because I added the pockets, I had no idea how to do that with pockets and my little brain couldn’t work it out. I’ve folded the seams inside and zig-zagged them to try and keep the fraying under control, but I’m expecting a lot of bits once it goes through the washing machine. I need to do some research into French seams and pockets before I make another one of these. Such a simple but wearable top! 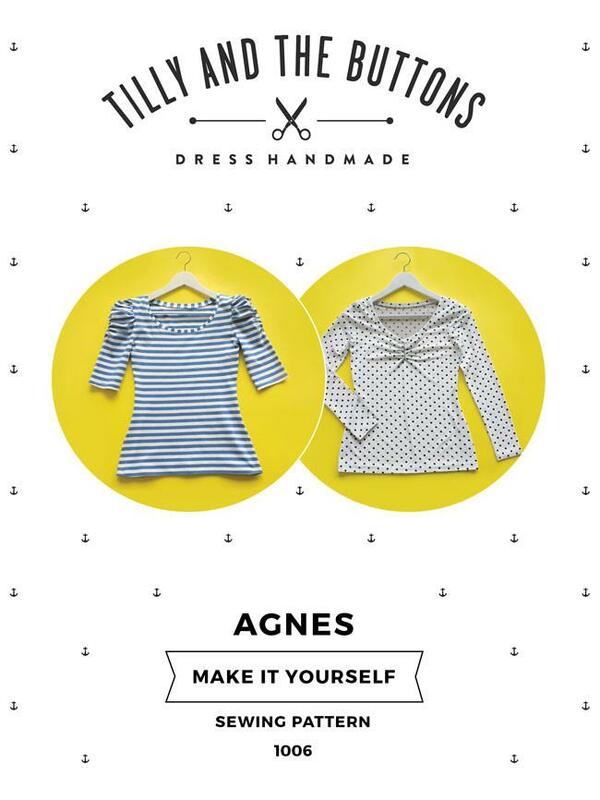 The Agnes sewing pattern by Tilly and The Buttons makes a simple, but very wearable jersey top. It comes with several options to make it more versatile, with different arm lengths and ruched details. I am coming late to this party though after my sewing hiatus, I think every sewing blogger under the sun has made stacks of these by now! I opted to buy the PDF pattern and download it and print it myself which cost £9.50. You can download the Agnes pattern here. The printed pattern costs £12.50. It took me a whole evening to cut out and assemble the pattern pieces, which makes me wonder how long I would take to assemble and cut out a dress or bigger project like this. It was easy to assemble though and felt a little like a brain training exercise! I bought some inexpensive jersey fabric from Fabric Land in Bristol for this make. It is very soft, with some stretch, and isn’t see through despite being black (yay!). It is covered in a very fine random polka dot pattern in silver. It was a bargain at £3.99 per meter. I bought 1.5 meters for this project and I have a fair bit left I could use for something-or-other. 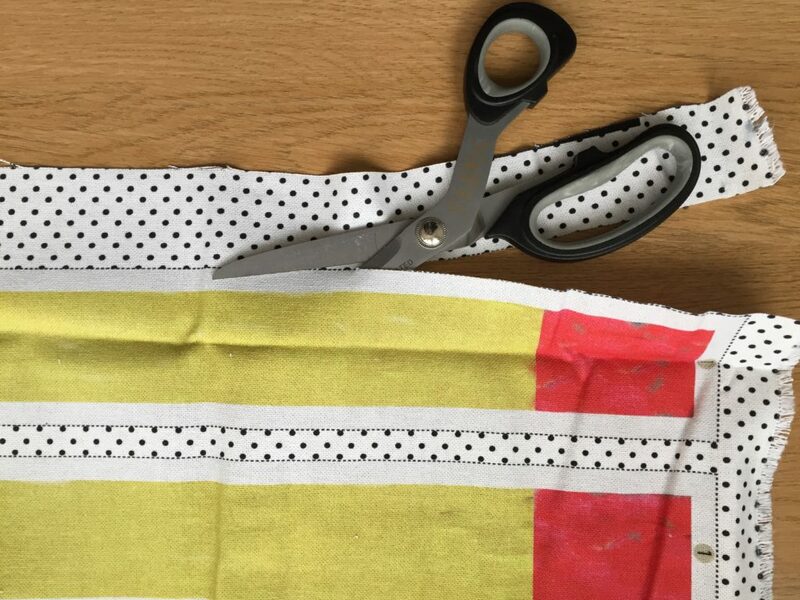 I used my normal sewing machine for this project and opted to do the super easy route of just using zig zag stitch and it has worked very well. I bought ball point needles for this project and they have worked well. I will try using a twin needle on a future project. The sizing is straight forward and it does seem to come up very true to what the patten says which is a huge surprise for me after lots of dubious sizing problems with commercial sewing patterns. I have a large bust and most clothes are a bit annoying to wear because I end up having pulling across the bust and loose fabric elsewhere like the shoulders, but not on this top! Its quite a miracle. The instructions are clear and quite easy to follow. I only had one small head-scratching moment and I think that’s because the instruction photos feature a bright striped fabric that I got confused by (stripe directions). I was nervous about sewing the neckband in, but it was surprisingly simple and I’m very impressed with the results, even when using zig zag stitch. In total, I think this took me four hours to cut out the fabric and sew together. I am sure if/when I make another one, it will be faster though. 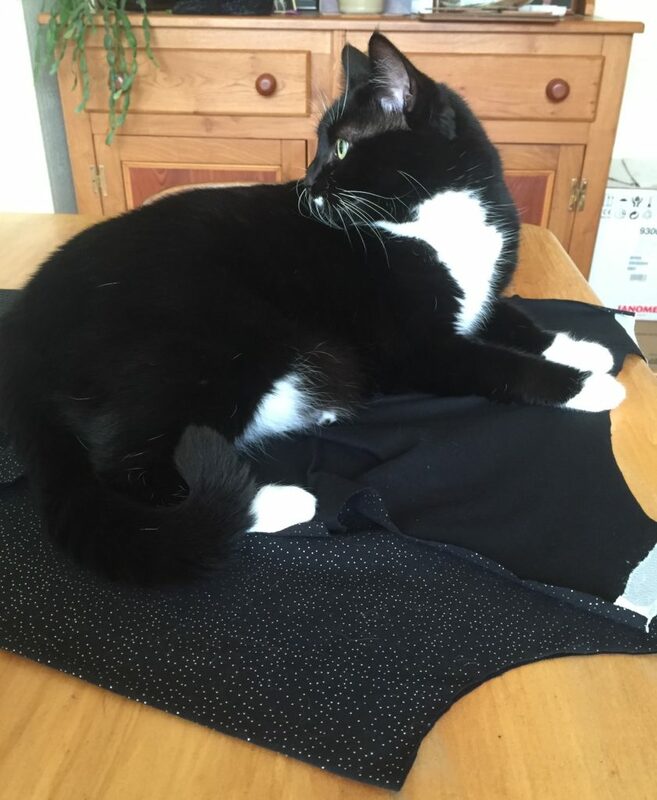 Excuse the cat hair – that’s what happens when you have a kitty assistant! A poor quality selfie taken hot off the sewing machine! Will I make this again? Yes, definitely. I just need some nice jersey! Any tips? Read all the instructions before starting. Use a ball point (jersey) needle. Try using stretch interfacing to secure the shoulder seams. Woodland Cabin Studio is a sewing, crafting and surface pattern design blog by Bonny Colville-Hyde.